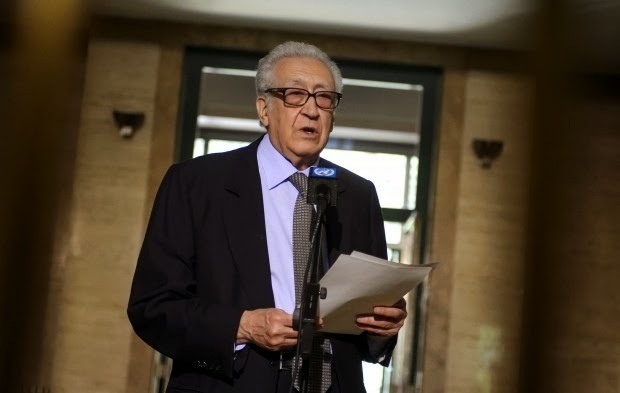 UN Syria envoy Lakhdar Brahimi said representatives from Syrian government and the opposition met in the same room at UN’s Palais des Nations for about three hours on Saturday. The two sides discussed a possible agreement to send an aid convoy to the besieged city of Homs for possible approval on Sunday, Brahimi said. The two sides will also discuss prisoner releases on Sunday. “The most important element discussed today was on humanitarian corridors for Homs, which has been besieged for the past 19 months without food,” Louay Safi, a spokesman for the Syrian Opposition Coalition negotiating team told journalists at a press conference Saturday evening. The parties on Monday will begin discussing the formation of a transitional governing body, Safi added.